The year 1950 can be considered as an important year in the history of Statistics at Banaras Hindu University when the teaching of the subject began for the first time at undergraduate and diploma levels. Another important activity took place in the history of the subject in the year 1962 when the teaching of Statistics was introduced at the post graduate level. Then teaching of Applied Statistics in the Section at under graduate level started in the year 1970. Initially, Statistics was a section of the Department of Mathematics and Dr. Pran Nath was given the responsibility of teaching of the subject. Professor S. S. Shrikhande, a renowned name in the subject, later on became the In- charge of the Statistics Section, who was succeeded by Professor M. N. Ghosh in the year 1963. Professor Ghosh could not continue as Head of the Section for a long time due to his sad demise in the year 1965. After his untimely death, the entire responsibility of running the Section went into the hands of Professor S. N. Singh. The faculty members of those days worked diligently under the noble guidance of Professor Singh towards the development of the Section and it was because of their untiring efforts that a full fledged Statistics Department came into existence in January, 1984. Professor S. N. Singh was appointed the first Head of the newly created Department of Statistics. 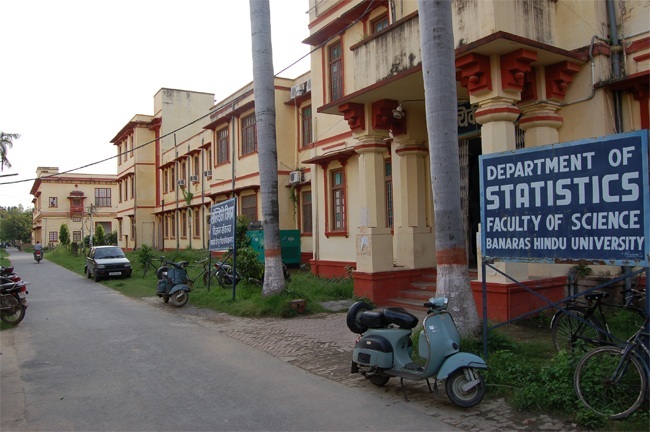 Department of Statistics, Banaras Hindu University has been one of the leading departments in the country. The University Grants Commission supported the department in the form of Special Assistance Programme (2009-14) and Department of Science and Technology, New Delhi helped it under its FIST Programme (2004-09). Besides, there is a Centre of Population Studies functioning under the department created by population Council, USA in 1969. The present building of the Department is situated at the ground, first floor and second floor of the old Three Year Degree Course (T.D.C.) Building in the Faculty of Science complex which is now popularly known in the university as Sankhyiki Bhawan. Presently, Department is headed by Prof. B.P. Singh. The sanctioned teaching posts in the department comprise of 3 Professors, 5 Associate Professor and 15 Assistant Professor. Presently, the department consists of 11 Professors and 3 Lecturers. Besides this, the Department consists of a number of non-teaching staff comprising of 1 Senior Technical Assistant, 1 Input / Output Assistant, 1 Senior Laboratory Assistant, 3 Laboratory Attendants, 1 Junior Clerk, 2 Peons and 1 Driver.